Dominion Building and Flack Block, originally uploaded by ajstrom. Work on the Flack Block heritage restoration at West Hastings and Cambie Street is almost complete. 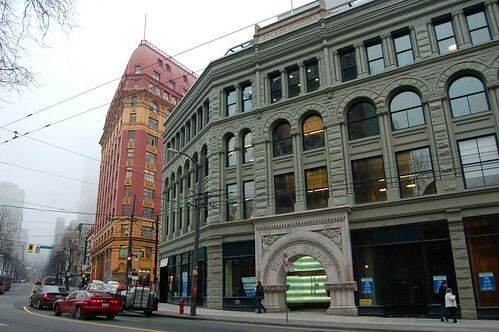 Joel Solomon of Renewal posted about moving their offices into the Flack Block on their blog. In addition to Renewal, other tenants of the new office space include Tides Canada, Hollyhock Leadership Institute, Penner & Associates, Forest Ethics, Raised Eyebrow, and Rainforest Solutions Project. See more pictures of their office space and some magnificent detail photos of the beautiful stonework on the archway on their Flickr gallery. The Tides Renewal Centre is springing to life. The exquisite renovation of the Flack Block by Robert Fung and Salient Group stands kitty corner from Victory Square on the Cambie and Hastings adjacent to the Woodward’s redevelopment. Vancouver street-front retail space may become the darling of commercial real estate this year due to authoritarian mall owners and a change in traffic flows. Increasingly, major mall space in Metro Vancouver is in fewer hands, allowing the owners to dictate rates and tenancy requirements that have some tenants chaffing. Oakridge Centre, Metropolis in Burnaby and Guildford Shopping Centre in Surrey, for instance, are all owned by Caisse de dépôt et placement du Québec, which runs them through subsidiary Ivanhoe Cambridge. A separate Caisse subsidiary, SITQ, owns Bentall Centre in downtown Vancouver. The Ontario Teachers Fund, through Cadillac Fairview Corp. Ltd, owns the other major shopping malls in the Metro region, Pacific Centre downtown and Richmond Centre in Richmond. “If the same person that owns Oakridge [Centre] owns [Metropolis at] Metrotown and the same person that owns Metrotown owns Guildford [Shopping Centre], they can decide, ‘You will not open up in any of our malls,’” said Thomas Skidmore, CEO, chairman and president of Glentel Inc.
Skidmore’s company owns 101 WirelessWave stores and 60 stores branded either Telephone Booth or La Cabine Telephonique at malls across Canada. It also operates 63 Wireless Etc. kiosks within Costco stores. “I would love to open up 10 stores in the Greater Vancouver area, if I could get malls to allow Telephone Booth to come in and give competition to other cellular dealers,” Skidmore said.